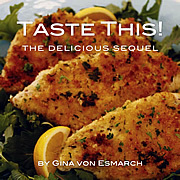 Published on August 25, 2010 in Recipes. 1 Comment Tags: Fritti Misti, mixed fried veggies, pasta, Pasta with oil and garlic, Spaghetti Aglio e Olio. Despite such cool weather in NorCal this year, which resulted in our garden being a bit behind schedule, it’s August and I am again nostalgically transported into the world of Italian Summer fare. While many jest that ‘the coldest winter they ever spent was a summer in San Francisco’ (Mark Twain) – it typically remains the case ONLY in San Francisco, and seldom in the other areas of the Bay Area. Typically, once one ventures 15 minutes by car to the North, South or East of San Francisco the weather is HOT. Note, I did say ‘typically’; albeit this year would be the exception. Finally, with a batch of summer veggies at the ready, I decided to get greasy and do a plate of pasta with some friti misti (mixed fried veggies). The key to these simple dishes is good olive oil. 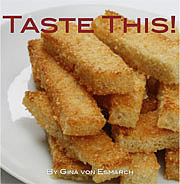 You can eat this fried goodness on top of pasta, on a soft baguette or even on their own. In a large-size pot add 1 TBS oil to water and bring to boil. Once boiling add in salt and then pasta. Cook the pasta according to package directions, al dente and drain, saving about 1/2 cup of the pasta water. 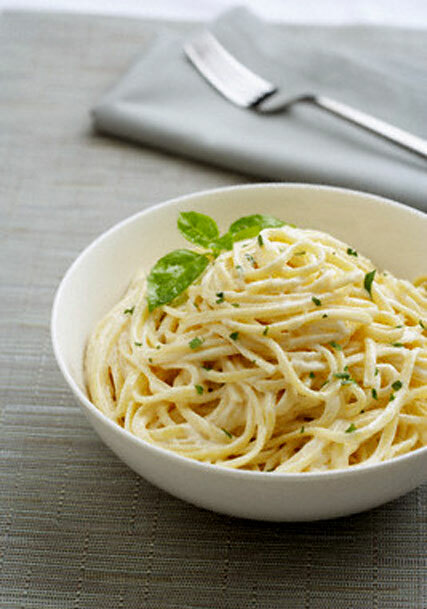 While the pasta is cooking, warm the olive oil in a large pan, add the garlic and heat just until the garlic turns golden. If using the red pepper flakes, add them. Set oil aside until pasta is drained. Place oil back on a medium-low flame and toss pasta, in the pan, with a light amount of salt until well coated. If the pasta seems dry add a bit of the of the pasta water to loosen it up. Add herbs and heat until warm. 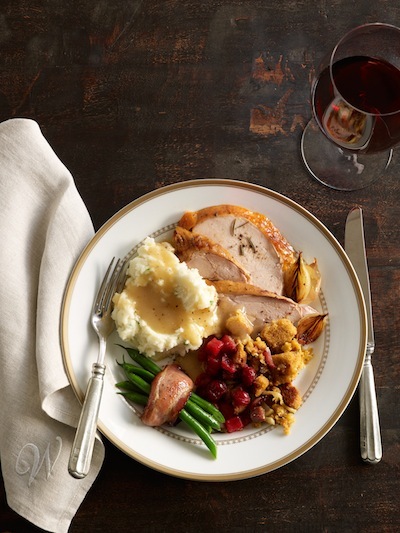 Serve immediately with a black pepper, and season with grated cheese. Serves 4 as a main dish, 6 as a side dish, or 8 if eaten with a heaping mound of pasta. Wash, dry and cut zucchini, yellow squash and egg plant length-wise. In a pan, avoid a non-stick pan if possible for better browning results, add ½ inch of olive oil in your pan and bring to medium heat. Line a baking sheet with paper towels so that you can transfer the fried veggies over and drain off some of the olive oil. 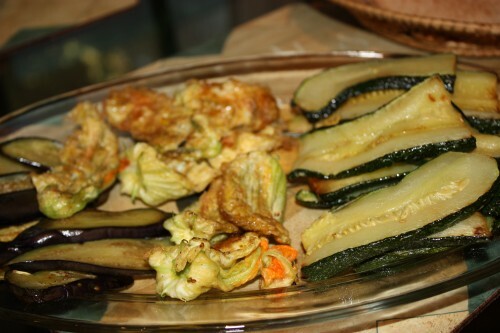 Complete all of these veggies before frying the zucchini flowers, as you do not want to risk dirtying the oil. 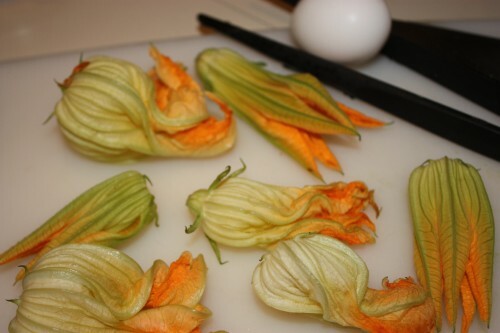 To prepare the zucchini flowers, remove the stamen (or stem in the middle of the flower), wash well inside and outside. Pat dry with a paper towel. Whisk egg and lightly coat flowers. Dredge flowers in flour mixed with a dash of salt and pepper and pan fry until golden brown. 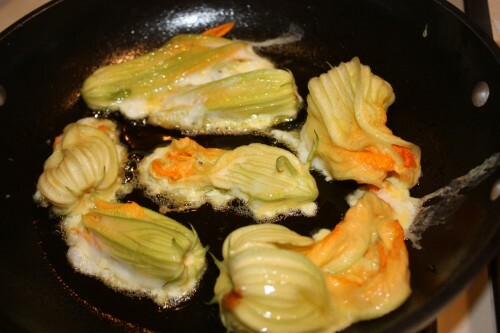 Zucchini Flowers in frying pan. To truly garner an Italian summer meal flair, make a nice antipasto plate. No directions necessary, there are no rules, just a mixture of nibbles and you are ready to feast.